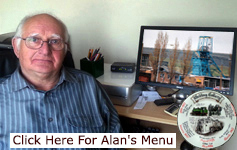 Hi Alan, I have been going through your site and came across deaths in 1938. My grandfather John Greasley (sometimes referred to as Jack) was killed working on top of Woolly colliery (Barnsley) in 1938. He was caught in a 'shunt' while maintaining a wagon but took four days to die. The official cause of death is listed as pneumonia following being crushed. For some reason the mine didn't seem to think this was important to list as a 'coal' accident? A bit more information I have been told there is a photograph somewhere of John standing by some 'Mitchells' coal wagons, I assume he repaired these and perhaps these were the cause of his death. Just as an aside, The name Greasley is apparently derived from Norse (Viking) Greasla which means man who greases wagon wheels. Looks like John went full circle. WW1, John was quite badly injured on the first day of the Somme which meant he could not go back underground. The injury he sustained meant he lost a part of his skull and was one of the first to survive a metal plate being inserted. This may have affected his hearing. He had quite a turnout for his funeral apparently. His colleagues help his widowed wife deal with her loss and he was buried in the main Barnsley cemetery, she was always very grateful to them. John Greasley lived at 19 Harley St, Barnsley in what was a miners house provided by the company. He had two daughters. After he died the company repossessed the house. His colleagues argued her case and provided funds for her to move to a smaller property (Number 1) in the same street (bottom right) which is what I remember of visiting Barnsley as a child. John Greasley's family links are also from Wombwell. John’s job was wagon repairer and 19 empty, repaired wagons, were standing in the empty sidings, spaced 3 to 4 feet apart. They were being pushed together by the locomotive so that they could be coupled and then removed for service. John Greasley, the wagon repairer, was crossing the line between the 3rd and 4th wagons when he was crushed between the buffers. He died 1½ days later. A long blast had been blown on the locomotive before the wagons were moved and the shunter stated that he had walked round them to see if there was anyone in danger, but had not seen anybody. 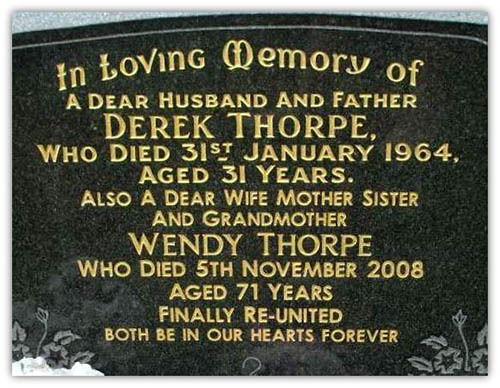 "31- 01-1964, Derrick Thorpe, 31, Rossington Main, Multiple injuries"
His correct name is Derek Thorpe, see attached gravestone picture. If possible can his name be changed? My Grandfather was killed in a fall of roof at Glapwell Colliery on Nov 28th 1918. His name was George Rimmington aged 35. I got details of the inquest from Derbyshire Times 7/12/1918 page 6 from Chesterfield library. Thank you for your efforts to record these sad events. I was looking at your web page at the deaths at Harworth Colliery. My grandfather is listed on there as Charles Cyril RENHAND but his name was RENHARD. The date of the accident was 30.01.1951. Your site has been very useful as I don't know much about my grandfather, I wasn't sure when he died and just had an approx year and his name. My father wasn't very old when his dad died so he doesn't remember much of him, I just felt it was the right thing to correct it as it says to contact you if anything is incorrect. Hello, my name is Iris Radford (nee Gee) and my husband found my dad my dad's fatal accident listed on your site. My dad, Frank Sidney Gee, was killed on 26th February 1963. On your lists of fatalities it is listed as 26th March. The address is wrong too. It's Morley Ave and not Morley road. On the inquest details the listings are correct but have not been transcribed correctly. Thank you for this site. It actually helped me with how my dad was killed - I was told (aged 10) that there had been a roof fall. Can anyone help me please with a few queries? 1. the date period, during the 1960s when the BPD loco road was lowered due to a result of sinking rings. I’ve been searching many years to find a reference to the death of my mother’s brother down the mine. This is the first time I’ve found any information on him at all, thanks to your web site. He was killed at Popes & Pearsons Colliery Altofts 06 June 1932. Can you please tell me is it’s possible that there will be an official report of his death somewhere and if so, where would it be please? The death is listed in the 1932 book at Doncaster Archives centre which is an old school on King Edwards Road. Opening hours 9am to 12.30 then 1.45 to 4.30. Details are listed with the description written by the Mines Inspector. Accessed from Junction 36 on A1M....Warmsworth Road...off Balby Road. I think you have a typo on your document, Bill McCulloch was 26 at the time of his death, your sheet states 36. I vividly remember the detail coming on the news at the time. I am writing to you regarding fatalities at Silverhill colliery one of these has the name and date of the accident wrong it says Derek Hardy and date of acccident as 22-05-1985 the name should be David Hardy and the date of accident was 23-05-1985 his address is correct. My name is Mrs Val Hardy and I was David's mam.